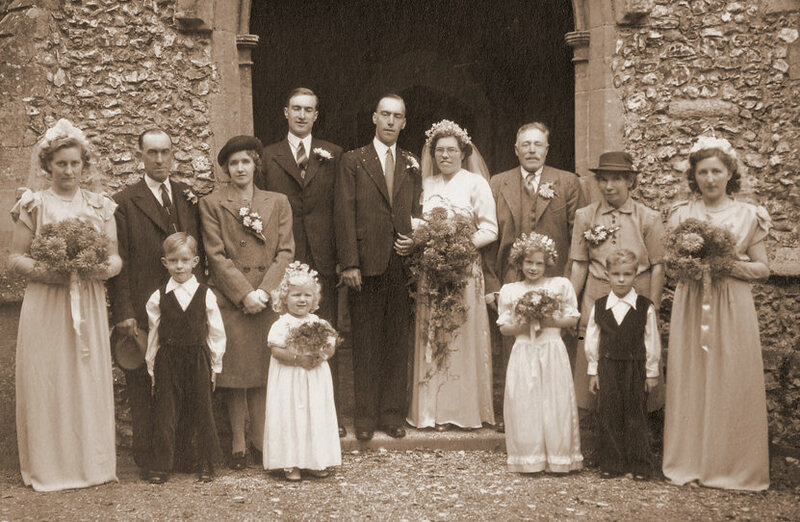 Fernley Farrow & Annie Elyard's wedding: (L to R) - Dorothy Sands, Peter Farrow (page boy), Wilfred & Violet Farrow, Glenis Allum (little blonde bridesmaid), Bernard Farrow (best man), Ted & Maud Elyard and Betty Starling far right. The page boy on the right is believed to be Annie's nephew, Colin Corley. His mother Freda was Annie's sister. (The other bridesmaid unknown). Information re Glenis Allum supplied by her sister Berenice Anderson, (née Allum) whose mother was a lifelong friend of Annie Elyard.